Corporate earnings for the first quarter are probably going to stink like a giant pile of dirty laundry in a teenager's bedroom. That's one of the main reasons why stocks have been on a mini-losing streak lately. Stocks fell again Thursday. It was the fourth straight day of declines. Analysts predict that profits for the S&P 500 companies will be down 4.6% from the first quarter of 2014, according to data from FactSet Research. This would be the first time profits have fallen since the third quarter of 2012. No wonder investors are jittery. Can the stock market really keep climbing if earnings aren't strong? 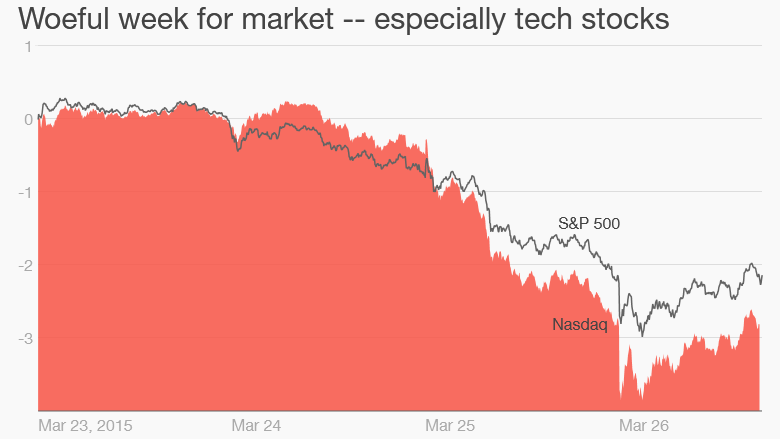 On top of that, more people are warning about high valuations for tech and biotech stocks in the Nasdaq. Mixed signals are also coming out about the health of the U.S. economy. This could just turn out to be a blip. But it could be a turning point after the six-year rally for the stock market. Weak oil + strong dollar = lousy earnings. Oil prices tumbled from over $100 last summer to under $50 in January. The energy sector has unsurprisingly taken a big hit. Cheap gas was supposed to spur consumers to spend more. The average American household is expected to save about $750 this year. But so far, consumers and businesses are just pocketing the savings. They aren't buying much. Overall sales are expected to fall nearly 3% during the quarter. Intel (INTC) and Tiffany (TIF) have cited weaker demand this month when they cut forecasts. So did railroad Kansas City Southern (KSU) and flash memory storage chip maker SanDisk (SNDK). The strong dollar is also to blame. The greenback has surged against the euro so far this year. This may be good news for consumers looking to take a vacation overseas or buy imported goods. But it hurts companies doing big business internationally. Big multinational firms like Microsoft (MSFT), IBM (IBM), Procter & Gamble (PG) and Caterpillar (CAT) warned that the strong dollar is a major headwind when they reported fourth quarter results in January. Profits take a hit when translated from weaker currencies back to dollars. Better times ahead? The earnings deluge is set to begin in a few weeks. JPMorgan Chase (JPM), Johnson & Johnson (JNJ), Netflix (NFLX) and General Electric (GE) are some of the most well-known companies set to report first quarter results during the week of April 13. Investors will be paying close attention to what these and other companies say about profits for the rest of the year. There are some faint flickers of hope in that regard. Oil prices have rebounded from their lows, although it's hard to celebrate the reason behind it: Saudi Arabia's air strikes against Yemen. It's also not yet clear if the energy sector has worked through the supply glut issues that led to the big drop in the first place. The dollar has started to lose some of its mightiness lately as well. So that could bring some relief to the big brand-name blue chips with significant operations in Europe and Asia. For the full year, analysts are still expecting profits to grow, albeit by a modest 2.5%. And revenues are expected to dip slightly from last year. The numbers look even better for 2016. Analysts are predicting an earnings increase of more than 12% and sales jump of 6%. Too much optimism? But Wall Street is notoriously too bullish. At the end of 2014, analysts were actually predicting a profit increase of 4% for this quarter. So it may not be a good idea to trust 2016 projections just yet -- especially since higher interest rates from the Fed could weigh on profits too. "Earnings estimates are still too high for this year and next," said Eddie Perkin, equity chief investment officer at Eaton Vance. He thinks investors should reasonably expect earnings growth of about 6% for 2016 and the next few years. Here's the bottom line (literally): Earnings (aka the bottom line) are what drive the market. If earnings aren't growing much, it's hard to imagine how stocks can do that well. A temporary breather for the market would not be the worst thing in the world either. The S&P 500 is up more than 200% since the bear market low in March 2009. And it's worth remembering that this rotten week for stocks follows a great one last week. The S&P 500 remains just a little more than 3% from its all-time highs. 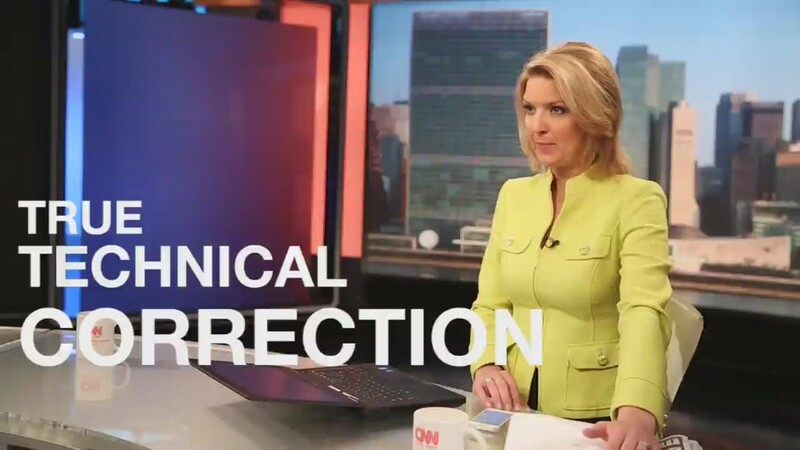 Many experts think a correction -- or 10% pullback -- is needed to restore some sanity to the market. And we haven't had one of those in nearly three-and-a-half years. We are long overdue. "I wouldn't mind seeing a bigger pullback so we could finally get some real bargains," Perkin said.